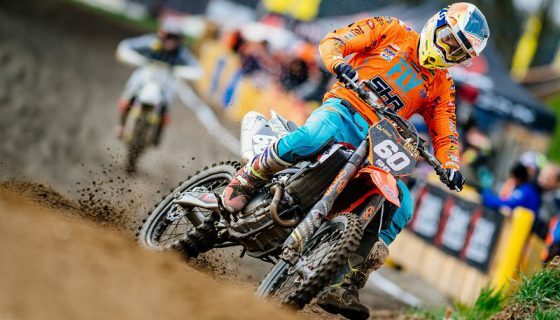 Herlings and Prado Finish Strong in France. The 2018 MXGP of France has concluded at the beautiful Saint Jean d’Angely circuit where Red Bull KTM Factory Racing’s Jeffrey Herlings and Jorge Prado stole the show and the overall wins. 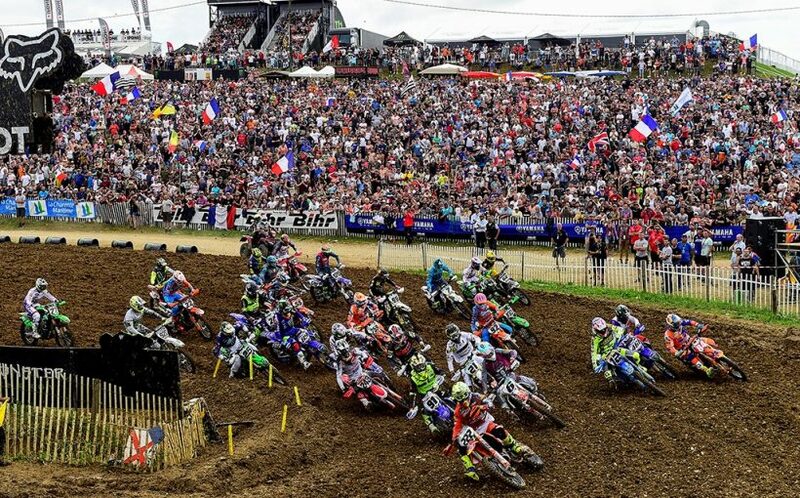 The whole weekend from Saturday morning until the final podium on Sunday, French fans filled the hillsides and watched the best riders of the FIM Motocross World Championship. An overnight storm naturally watered the track for today and even if it was soft in the morning it later developed into prime conditions. The occasional air horns and gas powered noise makers were drowned out by even louder cheers from the thousands of spectators. 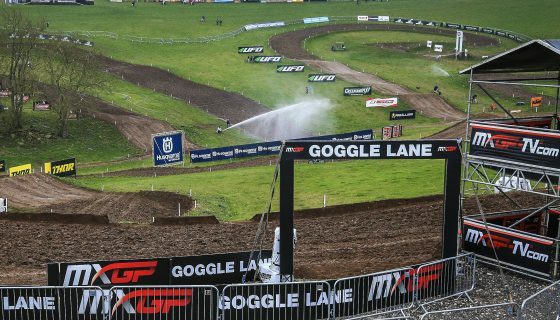 MXGP Race 1 was off to an interesting start when Red Bull KTM Factory Racing’s Jeffrey Herlings used his first gate pick to line up on the far outside. The gamble however payed off as the harder packed dirt gave him a head start and a massive Fox Holeshot. Herlings lead only grew as he put in fast lap after fast lap. Crossing the line second in what was easily his best start of the season was Standing Construct KTM’s Valentin Guillod who was followed by another Swiss rider, Wilvo Yamaha MXGP Official Team’s Jeremy Seewer. However by the end of the first lap Monster Energy Kawasaki Racing Team’s Clement Desalle, along with Red Bull KTM Factory Racing’s Glenn Coldenhoff and Antonio Cairoli, had made it around the Swiss duo. Desalle then latched onto the speed of Herlings while Coldenhoff fought Cairoli to stay in the top 3. Cairoli was throwing everything at Coldenhoff from different rhythms to the inside of a corner on one lap and to the outside on the next. For 9 laps Cairoli tried to get past Coldenhoff before finally making into third. All the while Herlings pulled away from Desalle. Slightly further back Seewer was 5th ahead of Monster Energy Yamaha Factory MXGP’s Romain Febvre. On lap 13 of 17 total Febvre was passed by Team HRC’s Tim Gajser who was on a late charge. Gajser was 8th on lap 2, but after his pass on Febvre he was in a rhythm and carried on to pass Seewer and Coldenhoff finishing 4th behind Herlings, Desalle, and Cairoli. At the start of Race 2 Herlings tried for another Fox Holeshot but had no such luck and was outside the top 5 in the first corner while Cairoli led Seewer over the line. Gajser massed Seewer on the opening lap as Herlings made several quick passes to get into 4th. By the end of lap 2 Herlings was third but Cairoli and Gajser had already started to pull away. The French fans were on their feet as Rockstar Energy Husqvarna Factory Racing’s Gautier Paulin moved from 5th to 4th with a pass on Seewer. 3 laps later the home crowd was again yelling because Febvre was alongside Seewer. At the halfway point Herlings made a pass on Gajser stick for second and looked forward to Cairoli in the lead. 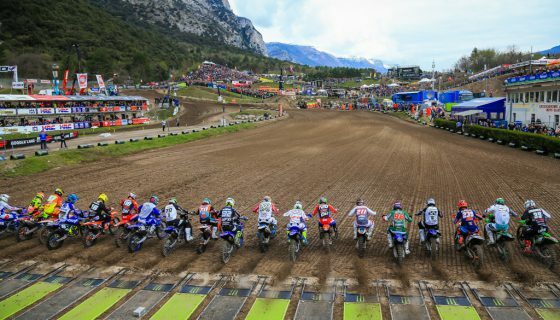 At the same time the French favorites, Paulin and Febvre, where in a battle for 4th. Febvre tried taking the spot in the first turn just past pit lane and on his second attempt in 2 laps made it happen. At the front Cairoli’s lead was gone and Herlings made a pass at the top of the uphill with just over 4 laps to go. Cairoli was unable to counter and settled for 2nd with Gajser taking 3rd, Febvre 4th, and Paulin 5th. For the overall podium Herlings stood on the top step ahead of Cairoli, and Gajser. Desalle missed the podium by just 1 point and was the lone Monster Energy Kawasaki rider in the race today since Julien Lieber opted not to start following his crash from Matterley Basin last week. MXGP Race 1 Top Ten: 1. Jeffrey Herlings (NED, KTM), 34:05.232; 2. Clement Desalle (BEL, Kawasaki), +0:05.660; 3. Antonio Cairoli (ITA, KTM), +0:06.322; 4. Tim Gajser (SLO, Honda), +0:27.283; 5. Glenn Coldenhoff (NED, KTM), +0:28.840; 6. Jeremy Seewer (SUI, Yamaha), +0:29.420; 7. Romain Febvre (FRA, Yamaha), +0:31.420; 8. Gautier Paulin (FRA, Husqvarna), +1:03.975; 9. Evgeny Bobryshev (RUS, Suzuki), +1:14.751; 10. Valentin Guillod (SUI, KTM), +1:16.726. MXGP Race 2 Top Ten: 1. Jeffrey Herlings (NED, KTM), 34:38.032; 2. Antonio Cairoli (ITA, KTM), +0:08.838; 3. Tim Gajser (SLO, Honda), +0:40.401; 4. Romain Febvre (FRA, Yamaha), +0:49.798; 5. Gautier Paulin (FRA, Husqvarna), +0:52.800; 6. Clement Desalle (BEL, Kawasaki), +0:55.315; 7. Glenn Coldenhoff (NED, KTM), +0:56.529; 8. Jeremy Seewer (SUI, Yamaha), +0:56.531; 9. Evgeny Bobryshev (RUS, Suzuki), +1:16.573; 10. Ivo Monticelli (ITA, Yamaha), +1:17.441. MXGP Overall Top Ten: 1. Jeffrey Herlings (NED, KTM), 50 points; 2. Antonio Cairoli (ITA, KTM), 42 p.; 3. Tim Gajser (SLO, HON), 38 p.; 4. Clement Desalle (BEL, KAW), 37 p.; 5. Romain Febvre (FRA, YAM), 32 p.; 6. Glenn Coldenhoff (NED, KTM), 30 p.; 7. Gautier Paulin (FRA, HUS), 29 p.; 8. Jeremy Seewer (SUI, YAM), 28 p.; 9. Evgeny Bobryshev (RUS, SUZ), 24 p.; 10. Shaun Simpson (GBR, YAM), 18 p.
MXGP Championship Top Ten: 1. Jeffrey Herlings (NED, KTM), 486 points; 2. Antonio Cairoli (ITA, KTM), 424 p.; 3. 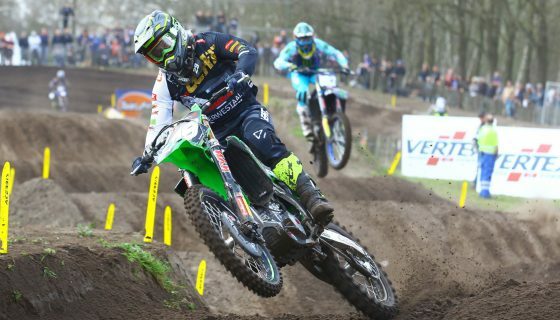 Clement Desalle (BEL, KAW), 351 p.; 4. Romain Febvre (FRA, YAM), 323 p.; 5. Gautier Paulin (FRA, HUS), 296 p.; 6. Tim Gajser (SLO, HON), 295 p.; 7. Glenn Coldenhoff (NED, KTM), 267 p.; 8. Jeremy Seewer (SUI, YAM), 226 p.; 9. Jeremy Van Horebeek (BEL, YAM), 219 p.; 10. Maximilian Nagl (GER, TM), 177 p.
MXGP Manufacturers: 1. KTM, 497 points; 2. Kawasaki, 362 p.; 3. Yamaha, 347 p.; 4. Husqvarna, 312 p.; 5. Honda, 310 p.; 6. TM, 177 p.; 7. Suzuki, 163 p.
MX2 Race 1 started with a rarely seen FOX Holeshot from Rockstar Energy Husqvarna Factory Racing’s Thomas Covington ahead of STC Racing Husqvarna’s Henry Jacobi. The usual MX2 holeshot king, Red Bull KTM Factory Racing’s Jorge Prado, was third while points leader and Red Bull KTM Factory Racing rider Pauls Jonass was back in 10th. Several positions were shifted in the opening lap with Prado falling as and Jacobi losing spots to Rockstar Energy Husqvarna Factory Racing’s Thomas Kjer Olsen and Jonass. Prado’s crash dropped him to eighth but he rebounded quickly gaining 3 positions on lap 2. Jonass meanwhile was battling with Jacobi for 3rd and the pressure of Prado closing pushed him back around the German. Prado then made a pass on Jacobi 2 laps later. Prado then had his sights set on Jonass and after chasing his teammate for laps took an outside line which then turned to the inside allowing him to push past. 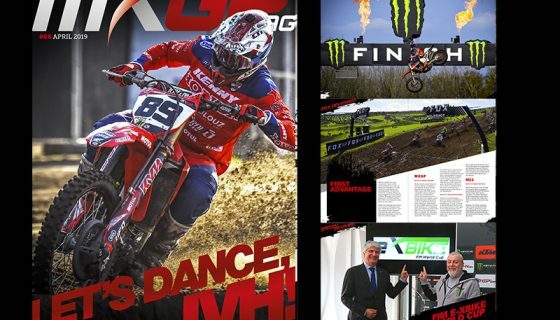 Next to challenge Jacobi was Kemea Yamaha Official MX2 team’s Jago Geerts and Honda 114 Motorsport’s Hunter Lawrence. Lawrence went down on the start and was charging back to the front from 17th. Geerts passed Jacobi on lap 11 and 2 laps after Jacobi fell which helped Lawrence into 6th. For the start of Race 2 Jonass returned to the front of the field but only until he fell on the first half of the opening lap. Jonass completed the first official lap in 17th while Prado pulled away from Geerts in the lead. Yamaha SM Action – M.C. Migliori’s newly signed rider, Michele Cervellin, was 3rd the first laps before Olsen jumped past on a charge where he gained 3 positions in one lap. Cervellin also lost a spot to Covington and Team HRC’s Calvin Vlaanderen. Pauls Jonass was on a mission to salvage points and did so climbing up the standings from 17th to 6th with his pass on Cervellin during lap 13. Kemea Yamaha Official MX2 Team’s Ben Watson was also fighting his way through the field and finished 7th. When the checkered flag came out Prado took the win over Geerts and Covington who found his way past Olsen. On the overall podium Prado and Covington tied in points but the victory went to the Spaniard with his better performance in race 2. Olsen rounded out the podium making it the first time the Rockstar Energy Husqvarna Factory Racing team had both riders in the top 3. MX2 Race 1 Top Ten: 1. Thomas Covington (USA, Husqvarna), 35:58.425; 2. Thomas Kjer Olsen (DEN, Husqvarna), +0:03.573; 3. Jorge Prado (ESP, KTM), +0:05.910; 4. Pauls Jonass (LAT, KTM), +0:11.808; 5. Jago Geerts (BEL, Yamaha), +0:15.171; 6. Hunter Lawrence (AUS, Honda), +0:31.713; 7. Conrad Mewse (GBR, KTM), +0:57.033; 8. Michele Cervellin (ITA, Yamaha), +1:00.917; 9. Ben Watson (GBR, Yamaha), +1:03.209; 10. Davy Pootjes (NED, KTM), +1:09.790. MX2 Race 2 Top Ten: 1. Jorge Prado (ESP, KTM), 34:19.853; 2. Jago Geerts (BEL, Yamaha), +0:03.163; 3. Thomas Covington (USA, Husqvarna), +0:05.751; 4. Thomas Kjer Olsen (DEN, Husqvarna), +0:12.352; 5. Calvin Vlaanderen (RSA, Honda), +0:18.444; 6. Pauls Jonass (LAT, KTM), +0:22.634; 7. Ben Watson (GBR, Yamaha), +0:23.243; 8. Michele Cervellin (ITA, Yamaha), +0:34.681; 9. Conrad Mewse (GBR, KTM), +0:35.047; 10. Stephen Rubini (FRA, KTM), +0:47.071. MX2 Overall Top Ten: 1. 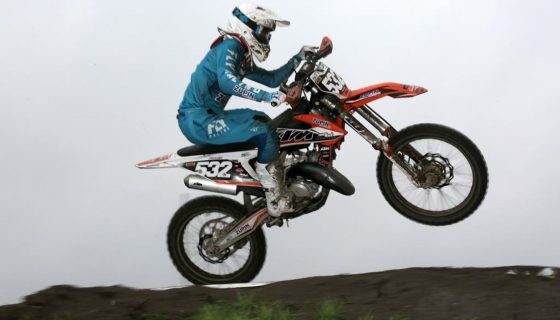 Jorge Prado (ESP, KTM), 45 points; 2. Thomas Covington (USA, HUS), 45 p.; 3. Thomas Kjer Olsen (DEN, HUS), 40 p.; 4. Jago Geerts (BEL, YAM), 38 p.; 5. Pauls Jonass (LAT, KTM), 33 p.; 6. Ben Watson (GBR, YAM), 26 p.; 7. Michele Cervellin (ITA, YAM), 26 p.; 8. Conrad Mewse (GBR, KTM), 26 p.; 9. Calvin Vlaanderen (RSA, HON), 25 p.; 10. Hunter Lawrence (AUS, HON), 23 p.
MX2 Championship Top Ten: 1. Pauls Jonass (LAT, KTM), 434 points; 2. Jorge Prado (ESP, KTM), 418 p.; 3. Thomas Kjer Olsen (DEN, HUS), 328 p.; 4. Ben Watson (GBR, YAM), 305 p.; 5. Calvin Vlaanderen (RSA, HON), 259 p.; 6. Jago Geerts (BEL, YAM), 217 p.; 7. Jed Beaton (AUS, KAW), 216 p.; 8. Thomas Covington (USA, HUS), 211 p.; 9. Henry Jacobi (GER, HUS), 187 p.; 10. Michele Cervellin (ITA, YAM), 187 p.
MX2 Manufacturers: 1. KTM, 489 points; 2. Husqvarna, 401 p.; 3. Yamaha, 339 p.; 4. Honda, 327 p.; 5. Kawasaki, 265 p.; 6. TM, 114 p.